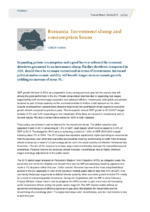 Expanding private consumption and a good harvest softened the economic slowdown generated by an investment slump. Further slowdown is expected in 2015, should there be no major turnaround in terms of investments. Increased political and economic stability will benefit longer-term economic growth, yielding an increase of some 3%.